Manufacturers apply laminate strips to cabinet door edges, framework and other small areas where unfinished materials need to be covered. Exposure to moisture and frequent use can cause the laminate strips to loosen, bubble or crack. Repairs are necessary to prevent damage to the substrate. Many laminated cabinets have particleboard, pressed board or other types of material under the laminate that will incur damage if they are not protected. Remove the loose laminate strip with a small metal scraper, and set it aside if it has no damage. Place the scraper under the lifted edge, and carefully pry and scrape the strip off without digging into the substrate. If only a part is lifted or broken, and the rest is intact and in good repair, use a utility knife to cut a straight line 1/2 inch past the damage. 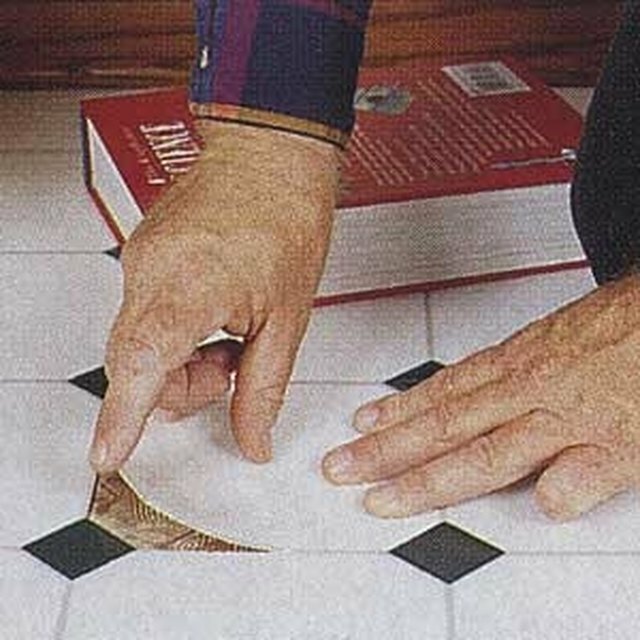 Scrape old laminate adhesive off the substrate with a metal scraper. Go over the exposed edge with 120-grit sandpaper lightly to remove any residual adhesive and lightly rough up the surface. If you are reusing the laminate strip, lightly sand the back of the strip to remove old adhesive. Wipe the area with a damp cloth to pick up the sanding dust. Place a piece of paper over the repair area, and trace the repair to create a pattern. Cut out the pattern with scissors. Place the pattern over the new laminate, and trace around the edge of the pattern. Cut the new laminate with a utility knife. If the old laminate was loose and has no damage, reuse it. Use a paintbrush to apply a thin layer of contact cement to the exposed substrate, and let it set until it becomes slightly tacky to the touch. Feel the contact cement every minute or so to determine when it becomes tacky. Place the laminate strip over the adhesive. Press in place, and run your hand over it to remove air bubbles. Hold it in place for two to three minutes, and then allow it to dry for one to two hours. Position the tip of a tube of laminate seam filler over any apparent repair line, and squeeze the tube to express a small amount to cover the seam. Smooth the seam filler with a small plastic straightedge. Typically, the straightedge is part of the tube's cap. Take the damaged laminate with you to the store to ensure an exact match.